Over the past two decades the economies of leading countries have increasingly evolved into knowledge-based economies, relying less on traditional resources such as capital and labour for wealth creation and growth. It is generally accepted that the creation of new knowledge, innovation and technological change drive progress in such countries.1 Economic activities based on new knowledge stimulate economic growth, provide higher wages and greater employment opportunities, as well as enhance a country's competitiveness within the global environment.2 These positive economic trends, prevalent in many developed countries, strongly depend on new technology investments, high-technology industries and highly skilled labour.3 These are essential ingredients in the making of a knowledge-based economy. South African science and technology related policies aim to drive South Africa's transformation to a knowledge-based economy.9,10,11 These strategic policy instruments are based on the concept that knowledge and innovation are essential components for economic growth and development, as well as for South Africa's global competitiveness. The Centre for Science, Technology and Innovation Indicators (CeSTII) of the Human Sciences Research Council is currently engaged in a project on KEIs for South Africa. The purpose of the study, for the Department of Science and Technology (DST), is to develop indicators to measure and monitor the development of a knowledge-based economy in South Africa. Even though science and technology indicator initiatives exist in South Africa, there is still paucity in the approach to the development of such indicators as a result of gaps between the conceptual and empirical aspects of measuring the knowledge economy. This study aims to expand the list of traditional indicators, such as R&D and innovation indicators, patent data and bibliometric data on patterns of scientific publications and citations, as well as to incorporate new indicators which will allow for a broader picture of the knowledge economy in South Africa. One of the key outputs of the study is thus to create a comprehensive portfolio of existing and new indicators. Indicators tend to have little relevance in isolation, but when compared with indicators from other countries based on the same methodology they serve as useful benchmarks for monitoring performance and competitiveness. The KEI portfolio, developed as part of the study, comprises individual and composite indicators from various databases by combining data from sources such as the R&D and Innovation Surveys undertaken by CeSTII, national and international financial data from institutions such as the World Bank, the OECD, the South African Reserve Bank and Statistics South Africa, as well as data from the Department of Education, other government departments and several higher education institutions. Data on publications and citations were available through the Thomson Institute for Scientific Information (ISI) database of research articles in ISI-indexed journals. All available, relevant and accurate data were included in the portfolio. Knowledge creation and human resource, as well as industry and global market place indicators are provided and discussed here. These indicators provide an indication of highly skilled labour; high-technology industries; innovation, research and development and competitiveness, which we propose are essential building blocks for a knowledge economy in South Africa. 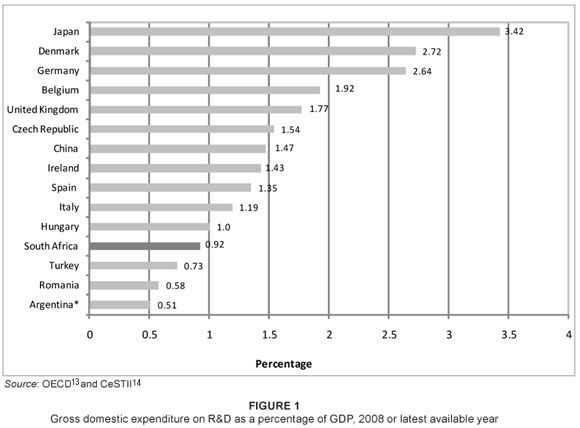 Gross domestic expenditure on R&D (GERD), as a percentage of GDP is one of the most important indicators of a country's potential for innovation and growth. This indicator reflects the intensity of R&D performance in a country. The indicator is sometimes used by politicians to set targets for future attainment such as R&D expenditure reaching 3.0% of GDP in the European Union by 2010 and South Africa reaching a 1.0% target for 2008.10,12 However, neither of these targets has been achieved. South Africa's GERD as a percentage of GDP amounted to 0.92% in the financial year 2008/2009 (Figure 1). South Africa compares well with middle-to-low income countries such as Hungary. With regard to other developing countries, South Africa ranked well below China's 1.47%, but higher than Argentina's 0.51%. R&D intensive industries such as pharmaceuticals and biotechnology are those where R&D intensity tends to exceed the industry norm, because R&D is essential to maintaining a competitive edge. These industries are dynamic and new developments, resulting in new products for the market and tend to be a common occurrence. Knowledge intensive firms, in such industries, use value-added scientific knowledge created by R&D activities to enhance their products and processes in order to meet the demand for new and improved products and services.15 The knowledge-intensive parts of an economy tend to be generators of employment opportunities and intensify the demand for highly skilled workers. 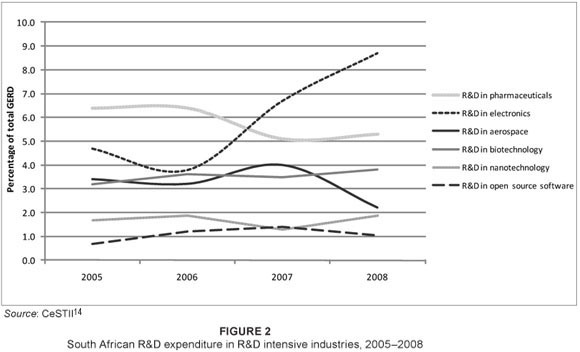 Learning on the part of both individuals and organisations as a result is crucial for realising the productivity potential of new technologies and longer-term economic growth.1 South Africa has a fairly strong investment in these R&D intensive industries and they accounted for about 22.9% of GERD in 2008 (Figure 2). While it is important to measure the extent of R&D in an economy, the concept of R&D is not readily apparent unless organisations assess their activities in terms of the extent that some of these activities (and associated expenditures and human resources inputs) are truly R&D and not routine scientific and technological activities. The OECD Frascati Manual16 provides guidelines for recognising and accounting for R&D activities. In contrast, patents and publications are traditional science and technology indicators which are readily quantifiable and auditable. These indicators are considered essential for providing a technical perspective of the knowledge economy and related innovative activities, because they are indicators of the outputs or productivity of the national system of innovation. Publications generally represent the outputs of academic research while patents represent the technological outputs of industry. South Africa applied for 265 patents at the United States Patent Office in 2008 and was granted 91 patents in the same year (Table 1) while countries such as India and Brazil were granted 679 and 103 patents, respectively. In terms of triadic patent families, where patents are sought for an invention in the United States, Europe and Japan, South Africa had 28 in 2008 compared to 9 by Argentina and 63 by the Russian Federation. 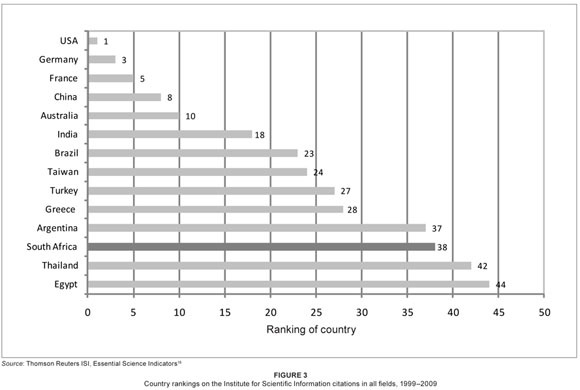 Regarding publication outputs, South Africa ranked 38th out of all countries in terms of ISI citations in all fields over the ten-year period 19992009. South Africa clearly lags behind other developing countries such as China, India, Brazil and Argentina (Figure 3). However the number of publications and citations should also take into account the relative size of the country's population and the total number of researchers. For example, Argentina's population was 39.5 million in 2007  smaller than South Africa's 49.2 million  indicating that Argentina has a relatively higher number of ISI citations per capita than South Africa. Highly skilled human resources are the most critical component when it comes to building a country's capacity for a knowledge-based economy. Total full-time equivalent (FTE) researchers per thousand total employment is a strong indicator of the incidence of high-level skills in a country's workforce. 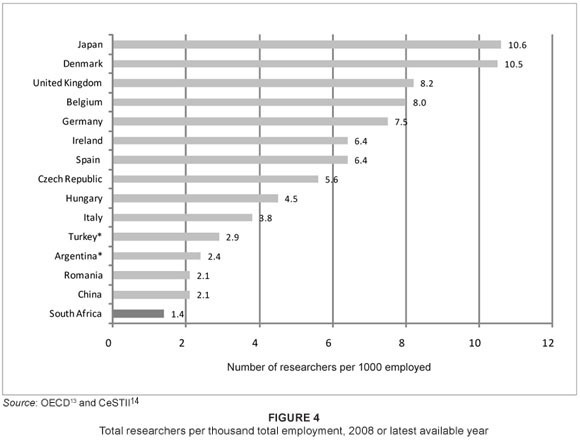 When comparing the selected set of countries in Figure 2, South Africa performs relatively poorly with only 1.4 full-time equivalent researchers per 1000 total employment compared to 8.2 in the United Kingdom and over 10 in Denmark and Japan. This is indicative of the well-documented education and human resource skills constraints in South Africa which is a crucial area for improvement if the country is to increase its competitiveness in the future. 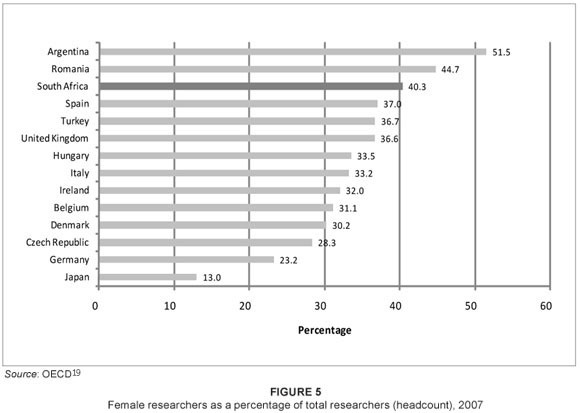 Female researchers as a percentage of total researchers amounted to 40.3% in 2007. According to South African R&D survey data the representation of female researchers has increased gradually but steadily over the last few years from 38.0% in 2003.1 Of countries presented in Figure 3, female researchers were best represented in Argentina (51.5%) and Romania (44.7%). It is noteworthy that the representation of women in European countries like Belgium (31.1%), Denmark (30.2%) and Germany (23.2%) was considerably lower. Industry and global market indicators are measures of overall competitiveness and how South African industry features in the international marketplace. A few key indicators are provided in Table 2. Foreign direct investment (FDI) as a percentage of GDP fluctuated between 2005 and 2007 and was quite low. FDI however increased to 4% of GDP in 2008. A large part of the FDI in South Africa comprises purchases of equity and share portfolio investments as opposed to fixed productive investment. South Africa has however recently become an increasingly attractive destination for investment and in 2009 attracted FDI totalling R43.8 billion (2% of GDP).21 The manufacturing trade balance, as well as the high technology manufacturing trade balance, is negative and it is clear that payments for technology are much higher than receipts. This means that South Africa imports and buys more technology than we export or sell. However these imports of technology can have a positive impact on the country if they are used productively or incorporated into new developments. For 2007 South Africa's technology balance of payments as a percentage of GERD stood at 60.2% compared with 4.0% for Japan, 35.8% for the United Kingdom, 50.6% for Spain and 91.3% for Belgium. The merits or demerits of these figures for different countries have to be examined in terms of the particular industrial structures and resources of each country. A specific framework of conditions is necessary to enable South Africa to make the required transition towards a knowledge-based economy. Important building blocks in this regard include: a focus on education and human capital development in order to meet the economy's demand for a highly skilled workforce, an effective national system of innovation which supports knowledge generation and a conducive business environment with a considerable degree of internationalisation and innovation. Policies to enhance the knowledge economy in South Africa should therefore include economic development strategies built around innovation, education and learning, as well as policies to develop competitive structures and strong organisations able to deal with global competition and market forces. The European Union and South Africa have both set targets for reaching R&D expenditure equivalent to a certain percentage of GDP by a given year. In the DST's ten-year innovation plan the target of R&D expenditure reaching 1% of GDP by 2008 has been increased to a target of 2% of GDP by 2018. However, in both the European Union and South Africa the business sector provides the greatest share of R&D expenditure. In 2007, approximately 63% of R&D expenditure was provided by the business sector in European Union countries, while in South Africa, business R&D expenditure was nearly 58% of GERD. This means that either government would have to invest in vast new R&D projects in order to achieve these new targets or an alternative would need to be found to encourage business to significantly increase its expenditure on R&D and this would best be achieved as a partnership with government. To have reached the 1% target for South Africa in 2008 would have required an extra R1.8 billion in R&D expenditure and the target of 2% by 2018 appears elusive. The current growth oriented exposition of the knowledge economy, rooted in the notion of free competition, is insufficient in terms of promoting long-term human development.23 This is specifically of importance with regard to developing countries aiming to compete in the international environment while facing various developmental challenges at home. A knowledge-based economy will not necessarily ensure national economic prosperity, improved health and well-being, ecological sustainability and reduced inequalities. A balance between the expansion of the knowledge economy and the issues concerning sustainability, long-term growth and development are therefore important policy considerations for South Africa. However, current policies in support of a knowledge-based economy in South Africa are too broad and attempt to simultaneously address the objectives of growth and development, while these essentially require distinct and specific policy emphases. We acknowledge all the researchers in CeSTII who have contributed to the Knowledge Economy Indicator Project.